Sometimes it feels like almost everybody is stupid, pompous and malicious. Of course you know they’re not… are they? Maybe it’s you. Never mind. You can learn to smile secretly at all the weird and obnoxious people and think of each one as an exotic flower. You can know that each person is alone inside. Each one is the same as you. You don’t have to love them, but you can force yourself, however reluctantly, to be kind to them. You can practice a special kind of self-control so that nothing – however infuriating it may be and however it gets on your nerves – nothing can make you angry. The trick? Just watch and watch and watch. Take it all in and watch like a lone little lizard on a leaf. Remember that you are alone and so is everybody else. Everybody’s alone inside their own individual self. To appreciate being alone in your solitary self takes a special kind of loneliness. It’s to be lonely without feeling lonely in the sad sense. This isn’t a poor little me, all alone, I’m so lonely attitude. No. This is a call to action! It’s a funny kind of lonely. You know you are alone inside. The philosopher of enjoyment asks,What are you going to do about it? Only the lonely can make the most out of an inner self. Anyone can take refuge in themselves with their five senses. Anyone and everyone who is motivated to step out of the rat race can cultivate idleness. Anyone can contemplate contemplations like an observation post. Anyone can live a secret existence in one long intoxicated life-trance like a lizard on a leaf soaking up the sun. All delicious sensuous moments occur within the solitude and silence of yourself. Lonely ones like you are not bound to reveal secret thoughts to casual friends. For a lonely soul, having fussy, gregarious friendships isn’t necessary. Acquaintances can be like being with ants in an ant-heap filled with chatter. The trick is to embrace every form, every colour, every curve, every single little thing with all your senses! Reduce yourself to its airiest, lightest, humblest, least personal and least self-conscious self to escape issues of hurt feelings. Have no expectations. Treat every living creature as if it has the same sensitivity as you, as if it has a selfwithin its body not so very different in its consciousness of itself as you have of yourself. Feel a unique kind of happiness in simple things experienced significantly. This unique kind of happiness includes feeling the glow of battle. Not only are you happy because you are thrilled by the contemplation of a leaf against the sky or by a meadow lark against the horizon or a cup of coffee and a biscuit, you are happy because you get the glow of Victory! In these moments of attention, life overcomes death, good overcomes bad, friendship overcomes malice, peace overcomes agitation and pleasure overcomes pain. The purpose of life is to live a special kind of happiness. It’s not based on feeling excitement or just pleasure. It’s deeper than that. The purpose of life is to enjoy it and in order to enjoy, the thing to do is to be forever losing yourself in delicious physical sensations. 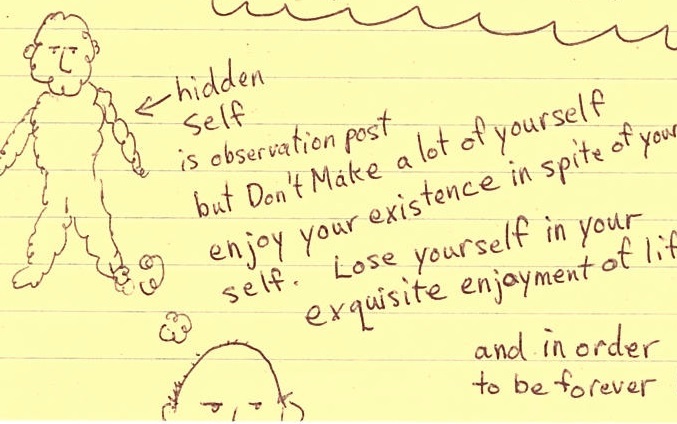 Lose yourself in your own particular enjoyment. Picture yourself as a gecko on a leaf. Enjoy gecko contemplations in a gecko world. He had what he lacked.